My chosen charity is one you probably won’t have heard of. It is called Big Brother Mouse and is based in Luang Prabang in Laos. Before I stumbled across it I did a fair amount of internet surfing, and made enquiries of several friends with knowledge of the region. I discovered that there are many projects working on improving literacy in Asia, including UNESCO, and other well-known names such as Save the Children. Big Brother Mouse is dedicated to producing and publishing exciting and interesting books in the Lao language, primarily for children, and to promoting those books and the love of reading in schools throughout the country. It aims to increase literacy and spread the word in Laos that reading is fun. I was really struck by the practical, grass-roots ethos of Big Brother Mouse. It isn’t an NGO or affiliated to a renowned charity, but rather it is run and staffed by local people on a not-for-profit basis for a very worthwhile local cause. I visited Luang Prabang in 2008 with my family, and I wish I’d known about Big Brother Mouse then. Laos is a beautiful country, and with its laid-back atmosphere, friendly people, lush tropical hills, rivers and waterfalls, is instantly attractive to tourists. We travelled by slow-boat down the Mekong from Chiang Kong in Thailand to Luang Prabang, stopping off at several Lao villages on the way. It felt rather intrusive to be part of a group of Westerners taking a conducted walking tour around these villages, looking at the wooden houses, the village temples, and the very basic schools in some. It was clear that the villagers are very poor, often eking out a subsistence level existence. But the people we met in those villages didn’t appear fazed or embarrassed by our visits in the slightest, and welcomed us in the warmest way imaginable. So when I stumbled across the Big Brother Mouse website and read more about those remote Lao villages, it really struck a chord with me. What I discovered from reading about Big Brother Mouse was that in many villages in Laos, many children own no books at all, their only experience of reading being from school textbooks. Not all Lao children even have the opportunity to attend school, although the number who do is gradually increasing. Until recently there were actually very few books produced in the Lao language - an added barrier preventing those children from learning to read. It must surely also mean that the Lao language itself is under threat. I remember the delight of my own children when sharing picture books with them when they were small, or reading to them at bed-time as they grew older. The availability, and endless supply, of wonderful books for children is something that we in the West take completely for granted. Big Brother Mouse was started by Sasha Alyson, a retired American publisher, along with three Lao students. 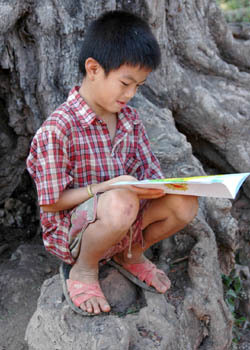 Its aim is to produce books that make literacy fun for Lao children. Sasha Alyson first visited the country in 2003, and noticed that there were very few books in the Lao language. When he asked people about it, he got the same response from everyone: "Lao people don’t read". In 2006 Sasha started Big Brother Mouse with two young Lao graduates, Khamla and Siphone, who had been novice monks together at a temple in the town. Together they rented a small shop in Luang Prabang and bought some second hand computers from Thailand. They were granted a business licence and a publishing licence and then they were off. Apparently, Luang Prabang officials had never before issued a publishing license and the charity still holds the only such license in Laos outside of the capital, Vientiane. The three of them wrote their first five books in Lao that year and produced them on those old computers. One of the first books, which is still very popular, was based on a story passed down through the generations in Laos, called The Cat that Meditated, and another one, Bangkok Bob, about a monkey that is delighted and overwhelmed by a first trip to the big city. Since those first beginnings, Big Brother Mouse now employs several young Lao people in Luang Prabang and has published more than 300 books in the Lao language. Although their first books were for children, they have now published on a wide variety of subjects including women’s health, the countries of the ASEAN, traditional fairy tales, and The Diary of Anne Frank. They also visit village schools across Laos taking books to them. There they hold book parties to get children excited about reading. They talk about books, sing songs, play games and each child gets to select a book. Big Brother Mouse then leaves between 80 and 100 interesting books in each classroom for daily reading. Before Big Brother Mouse went into these schools, many of them had no books at all that children could read for fun. When Big Brother Mouse first went to schools they kept transportation simple, only going to those villages they could reach by road. However, Many Lao villages can only be reached by boat or on foot. Boats were able to carry many books, but it was difficult to supply villages on foot with enough books. 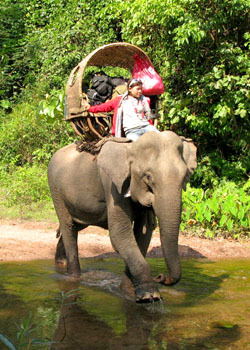 Elefantasia, a Lao based charity devoted to conserving the Asian elephant had an unemployed elephant that needed work. Big Brother Mouse took her on, named her Boom-Boom (which means books in Lao), and she now carries books into the villages that can only be reached on foot. She is also now the star of her own book, entitled The Little Elephant That Could. Big Brother Mouse also works with the teacher training college in Laos to give teachers hands-on experience of using books as they teach. In 2013 the charity measured reading skills in all five grades of rural primary schools and did that again in April and May 2014. Schools where Big Brother Mouse had worked with book parties and silent reading skills had improved by 26% more than those who had not been part of the programme. So this inspirational project is making a real difference to literacy in Laos! To connect with Ann click here.